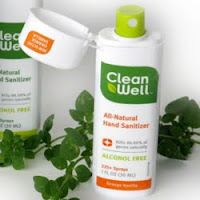 Lime Post: WIN 1 of 3 Cleanwell Natural Hand Sanitizers! WIN 1 of 3 Cleanwell Natural Hand Sanitizers! NOTE: We've extended the deadline for entries to this contest - you have until midnight, this Friday, November 20th to enter. See you on Facebook and good luck! We want to help you fight germs naturally, so we're giving away a bottle of our Cleanwell Natural Hand Sanitizer to three lucky winners. To enter, simply become a fan on our Facebook page and leave a comment on our wall telling us what you're doing to fight the flu. We'll be drawing for three winning fans on November 18th. Enter now! Cleanwell Natural Hand Sanitizers are available for purchase at Vancouver-based online eco boutique Lavish & Lime. Save 40% in our Sale Shop - Starts Today!